Vinyl flooring is one of the most favored choices for flooring, both for residential or commercial use. Vinyl is a to-go-to choice for flooring because it’s plastic, which means that it has moisture-resistant properties. It used to come in tiles, but manufacturers are now producing vinyl planks which can look like real wooden boards. 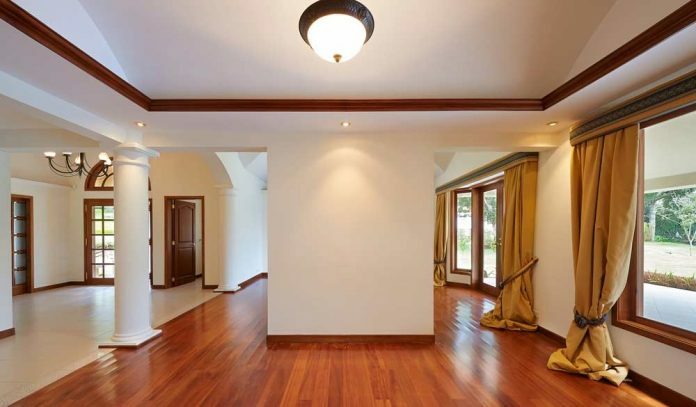 It’s also cheap, so people who are on a tight budget can avail of this type of flooring. If vinyl is your thing, and you’ve already invested in this flooring, the only thing left to worry about is the cleaning process, and how to keep it in top shape. All types of flooring require maintenance, and vinyl is no exception. Here are tips to help you have pristine vinyl flooring, leaving it spotless and gleaming. A doormat should precede your flooring. Some of the things which can cause damage to your flooring come from outdoors. To help you keep out these destructive things, place a doormat so you can dust off your shoes before stepping on the vinyl floor. Dirt that’s stuck to your shoes acts like sandpaper. If you keep walking around, it will cause more damage to your floor by removing the finishing. Avoid walking on the floor with dirty shoes. If you walked on asphalt in the way home, chances are some of the chemicals from the pavement will cling to your shoes. These chemicals can harm your vinyl, leading to yellowing. So either remove your shoes first or wipe it on the mat. Make sweeping a daily habit. 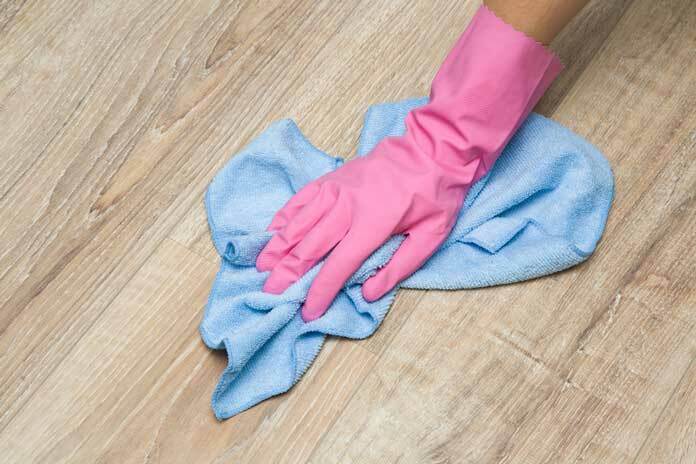 Remember that dirt can act like sandpaper, so make sure to clean your floor to remove dust and dirt on the floor. If you can, do it daily. Aside from a broom, you can also use a vacuum to help you clean the floor. Clean everywhere, including under large pieces of furniture. For thorough cleaning, add a mop to your cleaning routine. You can mix warm water and dish soap, and start mopping your floor. You can also add white vinegar if you feel that it needs the extra polish. Make sure to choose your mop correctly and avoid buying one with a built-in scrub brush. The brush can also act like sandpaper and scratch or damage your vinyl flooring so make sure to get one with microfiber mop head because it is the ideal cleaning tool for your floor. Clean up the mess right away. Yes, vinyl resists water but don’t let any liquid stay too long on the surface. Clean up and wipe spills to prevent staining. You can buy cleaners, but you can also use apple cider vinegar mixed with water for simple cleaning. If you spilled something acidic on your floor, clean it up using baking soda and water. Blend the two ingredients and apply the paste. Use a towel and rub until the stain is gone. Use vinegar and water to remove the mixture. Some stains can be hard to remove, such as lipstick or paint. You can remove these by using rubbing alcohol and a brush with soft bristles (hard bristles can scratch the surface). Be careful in using vinyl cleansers. Your cleaning style depends on the condition of your floor. Use the solvents specially made for certain types of vinyl flooring. Clean the floor with warm water and detergent to remove dirt if you need to wax your floor. Rinse off with cold water. You might get worried if you notice your floor losing its shine. However, the wax isn’t always the answer. If it doesn’t require wax, you can use a polish or sealant to make your floor shine again. Your furniture can damage your flooring, particularly heavy appliances. These appliances can also cause more damage if you transfer it to another place because it can dent or scratch the surface when you drag it across the floor. You can put floor protectors for your furniture and appliances to help avoid scratches and dents on your vinyl flooring. Make use of a plywood sheeting when moving heavy things across the floor. Vinyl is an ideal material for your flooring because it’s cheap and it doesn’t require high maintenance. If you’re cleaning your floor by yourself, you can put a doormat outside so you can minimize the dirt and harmful chemicals which can stick to your shoes and cause damage to the floor. See also: How good are floating floors for installation and budget? If you’re too busy to clean your floor regularly, top-rated janitorial service can help you with your flooring maintenance. Whether you or other people are the ones, who’ll maintain your flooring, make sure that you do the proper maintenance techniques to avoid damaging your floor any further. Caleigh Martin is a full-time student and a food enthusiast. She loves to cook during her free time and likes to read magazines about food and healthy lifestyle. She also has interests in travelling and writing.